You can use a Yandex.Metrica tag to collect statistics about sessions on Turbo pages. We recommend using the same tag on your site and Turbo pages to make it easier to work with statistics. Log in to Yandex.Metrica. If you don't have an account, register. Tag name — Enter any name. Site URL — Enter the site domain that you use Turbo pages for. You can enable additional settings for the tag. Attention. If you use the ad builder to generate Turbo pages for ads in Yandex.Direct, the Yandex.Metrica tag is created for these pages automatically. Under General site information, choose Yandex.Metrica in the Tags field and enter the tag ID. type* Accepts the value Yandex. params Use it to send session parameters. You can specify multiple turbo:analytics elements with different tag IDs. Upload the prepared file to Yandex.Webmaster. Note. If you specified a tag in an RSS feed and in the Yandex.Webmaster interface, the RSS data will have priority. Add the ID to the content you want to track statistics for as the data-goals attribute value. You can specify multiple comma-separated values, i.e., you can link multiple goals to a single element on a Turbo page. In Yandex.Metrica, go to Settings → Goals and click Add goal. In the Name field, enter a name for the goal to create. Data will start being transmitted to Yandex.Metrica after the robot checks the RSS feed and finds out about the changes. The created goal can be used in most Yandex.Metrica reports. You can also track conversions by goal using the Conversions report. In this case, a “Java Script event” goal is used. 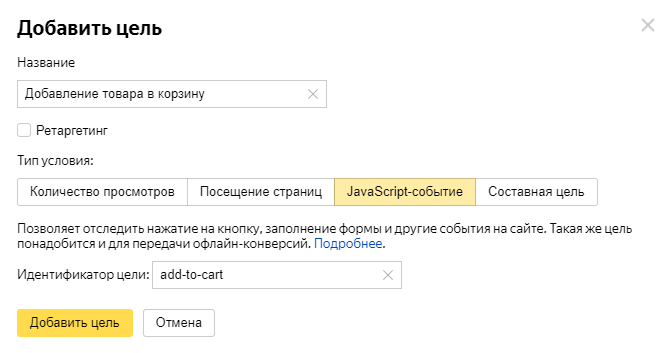 In Yandex.Webmaster, set up the Add to cart button. Enter the add-to-cart value as the ID. To track the sales funnel, use a “multi-step goal”. Read the multi-step goal requirements. To enable Yandex.Metrica to track the goal completion, set the same tag for the Turbo pages and your site's pages. 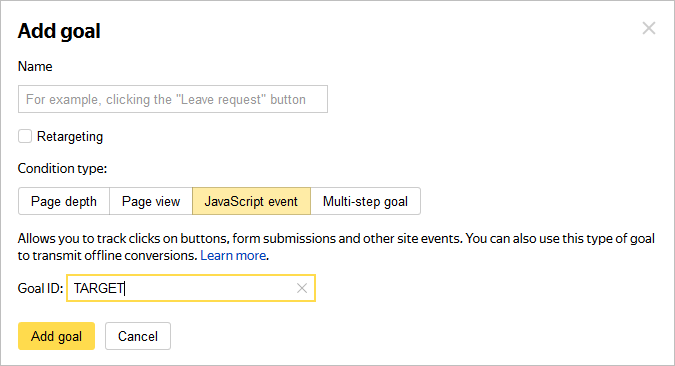 Create a multi-step goal with the steps of making an order on your site. If the user who made the order viewed the Turbo page during the session, Yandex.Metrica will include this session in statistics for Turbo pages. In Yandex.Metrica, go to Settings → Goals. For the condition, choose the “goal ID event”. Enter the add-to-cart value in the field. Yandex.Metrica links a session to statistics for Turbo pages if the Turbo page was viewed during it. In this case, view Yandex.Metrica standard reports. The data in the report is updated using the selected value.